1. Heat butter in a large deep pan over medium flame. 2. Add onions, mushrooms, capsicums and saute for 3 to 5 minutes. 3. Add the flour and stir for a minute or two. 4. Add the chicken stock and simmer for 2 minutes or until slightly thickened. 5. Add lemon juice, thyme, salt, pepper powder and chicken pieces. 6. Simmer for 10 minutes on low flame. 7. Remove from flame and add the sour cream. 8. Mix well and return the pan to heat. 9. Simmer for another 45 to 60 seconds. 11. Serve with garlic bread. 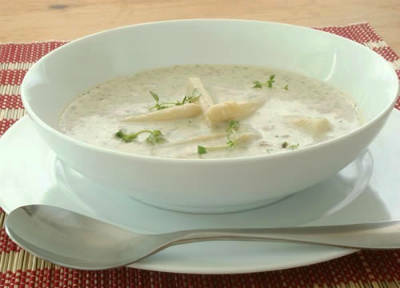 Feel free to comment or share your thoughts on this Creamy Chicken and Mushroom Soup Recipe from Awesome Cuisine.